Under Armour (UA) reports Q2 results tomorrow July 26 followed by conference call at 8:30am ET. Current consensus is for Q2 EPS of $0.02, operating income of ~$19 mln on revs +28% to $1.00 bln (guided for revenues in high 20s, operating income of ~$17-19 mln and flat gross margin). 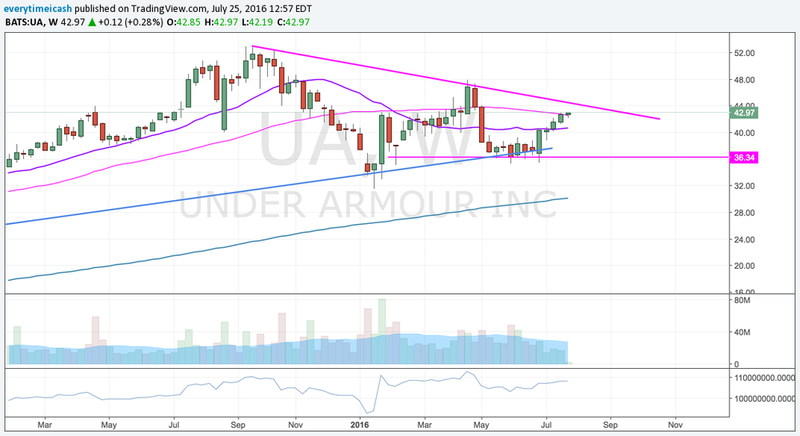 Since becoming a publicly traded company, UA has never missed earnings estimates. Last quarter, Under Armour beat Q1 EPS estimate by $0.02, reported revs in-line, guided Q2 operating income / revenues in-line and slightly raised FY16 guidance / reaffirmed margin guidance. Headed into the print: UA has held onto these recent gains and is back near pre-Q1 levels. Based on UA options, the current implied volatility is 14% higher than the historical volatility (over the past 30 days). UA Weekly Jul29 $42.5 straddle is currently pricing in a move of ~8% in either direction by weekly expiration (Friday). Current Quarter: Following the decision of the bankruptcy court to approve the liquidation of The Sport Authority's business rather than a restructuring or sale, Under Armour determined to recognize a Q2 impairment charge of ~ $23 mln and updated its Q2 and FY16 outlook. The company reaffirmed Q2 revenue growth in the high 20s but revised operating income to $17-19 mln (prior $40-42 mln) as a result of the impairment. Guidance: The Sport Authority mid-quarter update included revised 2016 guidance for operating income to ~$440 -445 mln (prior +23-24% to $503-507 mln) on net revenues +24% to $4.925 bln (prior +26% to $5.0 bln). Updated outlook will be included in the earnings press release - estimates are tracking slightly ahead of the this prior outlook with operating income of +11% to ~$453 mln estimate and revenues +25% to $4.96 bln. Click here to listen to my podcast and learn about my theory on the similarities between relationships and the stock market.